I'm starting with typing this post, even though I am actually going to publish these posts out of order. We have been taking weekly pregnancy photos since 2 days after we found out. I realized this weekend that I better start getting my thoughts written down before I forget! What better way than through my blog? Then I can share our updates with friends and family who are so excited about Baby H being on the way. Though....at this point only immediate family knows! But by the time you are reading this, it will be public knowledge! How big is the baby: Size of a grape! That seems so large! Weight gain: I still weigh the same as when I got pregnant. I've been up and down a few pounds here and there. 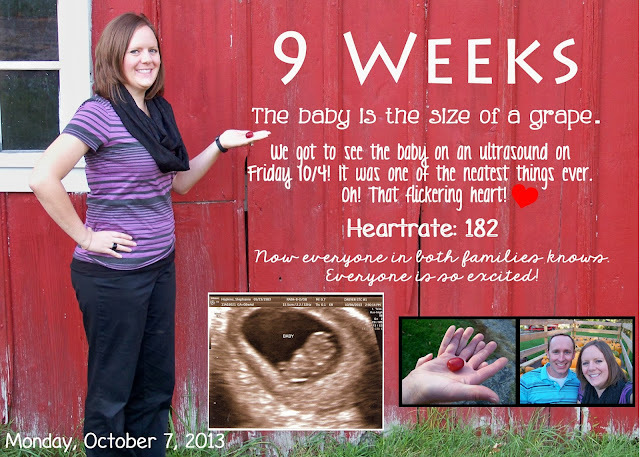 Doctor: We had the ultrasound on Friday and it was truly an amazing experience. First, I almost cried because my bladder was so full (they have you come with it full for a better view), so the tech let me empty it some. Then I really cried when we saw our teeny baby and saw that tiny flickering heart. Afterwards I asked Adam if he was excited because he didn't seem as excited and he said, "You weren't looking at me when we saw the baby! I was VERY happy!" I could have laid there all day watching that screen. And our baby actually looks like a baby! It is so cute laying all snuggled in there. Clothes: Mostly my regular clothes. I just feel yucky and bloated sometimes. Pants that were a little too tight before are really uncomfortable now. I got a couple belly bands from Target and have worn them twice. Sleep: Though I normally can sleep for days and I have been so tired, once I wake up I can't fall back asleep. Unfortunately sometimes that is at 3:30 am. Food/Aversions: For the most part my appetite is the same. Sometimes I wish I had more food aversions and could get away with just eating apples and bagels. But since I can eat whatever I want most of the time, I had stupid broccoli with dinner. What I miss: This is going to sound weird. But I miss having symptoms. Well, I haven't really ever had any that were super strong to miss. But I wish I did. I know anyone who has had bad morning sickness would slap me, but at least it is reassurance that the baby is OK. The last few days last week my symptoms almost completely stopped. That is scary! At least we had the ultrasound Friday to tell us everything was OK then. I know I should just count myself lucky, but it is hard to believe there's really a baby in there when I mostly feel completely normal. I could totally be one of those people who didn't know she was pregnant for months and months! My icky days I could chalk up to bad food or random heartburn! I could explain away my tiredness because I'm teaching two university classes this semester! What I am looking forward to: Telling people! Oh! And This: We are never ever going to agree on a boy name. And I would bet this baby is a boy! I stole this from Erin! I will use it for my updates from now on! A funny story: Auntie Erin said she was having a hard time believing that blob on the ultrasound was a baby. I pointed out the head, body, little arms and legs. Then said said, "OOOOHHHH! I thought the black part was the baby! They need to put that label on the right place!" I couldn't stop laughing! Adam and I spent the weekend with our pumpkins so I had to include a picture of them. Saturday all afternoon we picked the pumpkins and gourds. Don't worry, I didn't carry any really heavy ones and I didn't carry them for long treks. But! Most anything you could handle before pregnancy, you can do during! Sunday we washed all of our pumpkins and gourds! We are ready for Pumpkin Day next week. Well. Not really. But the pumpkins are ready. The hugely exciting news this weekend was that we invited Adam's family over for a taco night Sunday night to announce our good news to everyone! We put the ultrasound picture in a frame on the counter/table so everyone saw it as they got there! There were lots of hugs and cheers. We gave his parents some gifts to announce to them. We got a book for his dad called "Grandpa's Tractor" and a mini photo album for his step-mom that says "Grandma's brag book". They are grandparents many times over, but they were still super excited for us! His step-mom said whenever she has a rough day this school year (she is a teacher too), she will just think of this and smile! Exciting news around the house is that...oh about....3.5 years after starting the master bathroom, we finally have mirrors and glass! We have been using it for about a year....but it just made a mess. Now we just need to finish decorating. I am waiting for Adam to stain some crates I bought to put on the walls in the water closet. I love progress!